Two years ago we went camping at Maroon Bells. It was an enjoyable experience and we’ve been wanting to go back ever since. Campsites at Maroon Bells itself are pretty hard to come by, especially on weekends, so I had a reminder in my google calendar to make a reservation the second the sites opened up for our chosen days. Months ago that Google reminder popped up and I made a reservation hoping for a nice calm getaway, completely unaware that the trip would end up being bookended by a trip to Utah and Noel going to Scout camp. Such is life. Chris and Vanessa scrubbing the Volcano. We invited Noel’s sister, Vanessa Joy, and her husband, Chris to come with us. After a near death experience earlier this year, we figured they could use some R&R. The whole crew at Maroon Lake. Despite the insanity surrounding the trip, we did our best to relax. Not having cell phone reception at our campground greatly aided that. Ellen insisted on carrying her sleeping bag to our campsite. I loved our campsite. You took a short trail to get it so it was nice and secluded. This picture is taken from the “dining area” so the campground was also pretty spacious. We did an ambling “hike” with everyone and Noel and I went on a hike alone while Vanessa and Chris kindly watched the kids. Taking a break on our walk around the lake. Noel and me at Crater Lake, no not the one in Oregon. 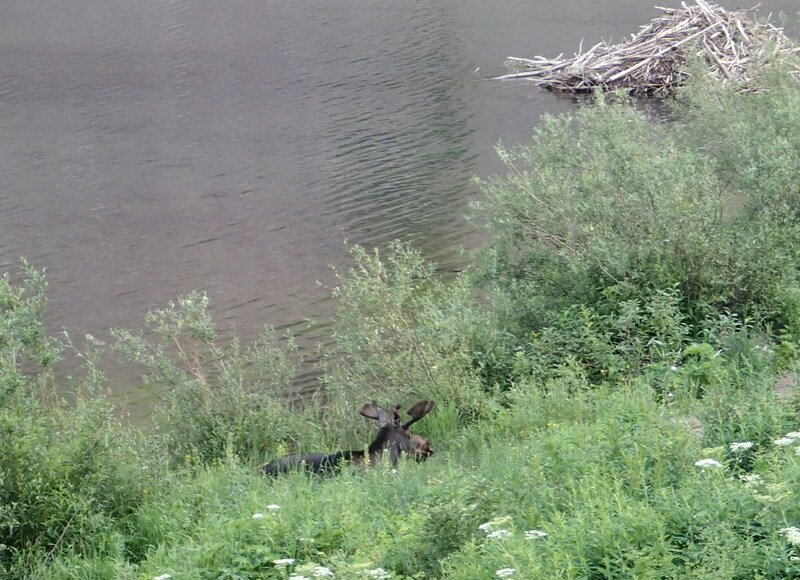 A moose we saw at the lake. Kids messing around instead of sleeping. Somehow Vanessa and Chris still thought the kids were adorable though. Phew. Holding hands with Uncle Chris. Aunt Vanesa Joy feeding Ellen cake for breakfast. Best breakfast ever. And because this is us, we also ate delicious food. Keep an eye on our food blog for all the recipes! Dutch oven summer vegetable tian. Simply delicious. All too quickly, we had to pack up and head our separate ways. We said our goodbyes to the beautiful scenery. When we got reception again Noel’s phone rang a million times with messages so I drove home so he could take care of scouting business. Chris and Vanessa brought the kids Toy Story toys (and cleverly assigned three toys to each of them so they wouldn’t fight). I’ll have to add another reminder to my google calendar so we can do this again next year, only hopefully not the day before Scout camp. Ha! I’m pretty sure there’s more than just and Cooper who are afraid of vault toilets! Wow, that is such pretty scenery. I’m totally adding it to my list of places I want to visit. We have Fort Carson on our list of duty stations where we would like to live – mainly so we can live near all the amazing places in Colorado.